To set up Data Binding, you will need to go to the "Advanced" section in the Properties box of a Repeat Group. Click the "Set Data Binding" button. The "Select file to attach" box will pop up, and it is here that you select the Excel spreadsheet resource that you want to use (you can also upload an Excel spreadsheet resource from here, if you don't have it uploaded already). Next, if there are multiple sheets in your Excel resource, you will need to specify which one is going to be used. This is done with the drop-down menu titled "Data Binding Table" that is beneath the "Set Data Binding" button. 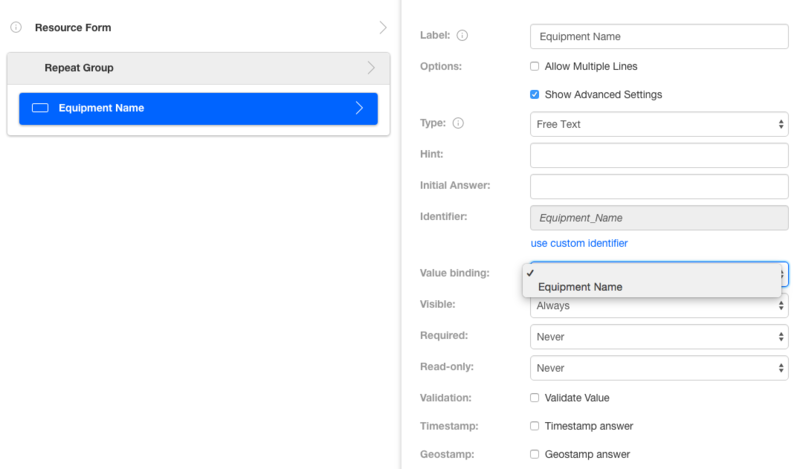 Now add a question for the Equipment name, along with any other questions you would like to have filled in by the Excel spreadsheet or the user. Note, for each row in the spreadsheet, a new Repeat Group will be generated. For the questions that you want filled in by the Excel spreadsheet, you will have to set the "Value binding" drop-down (found in the "Advanced" section in the Properties box of the questions) to the relevant columns in the Excel spreadsheet. You can do this for each of the questions that you want pre-populated with information from the spreadsheet. This concludes our overview of Data Binding within repeat groups. If you have any questions or comments feel free to send us a message at support@devicemagic.com or leave us a comment below.